A) They say: only 573,000 birds are killed yearly by wind turbines in the United States, and 888,000 bats – total: 1.4 million deaths. And they add: this is small in comparison to the many millions killed by other human activities. They conveniently forget that wind turbines are the only human activity that kills BATS – if you accept the taking down of roofs, houses, buildings and other constructions. 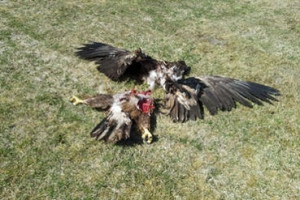 But apart from that, there is another, much higher and much more likely estimate: 13 to 39 million birds and bats killed annually by wind turbines in the United States – based on an extrapolation from Spanish monitoring reports. It is a valid extrapolation, for there are no reasons to believe that US birds are smarter or more cautious than Spanish ones. Figures from Germany and Sweden confirm this high level of mortality, as published by the California Energy Commission. Consider this: one bat a day and one bird every other day = 365 bats and 182 birds a year x 39,000 wind turbines = 21 million birds and bats killed in the US annually. The low official estimate of 1.4 million can be explained by deficiencies shown by Jim Wiegand here: http://www.windturbinesyndrome.com/2013/wind-energys-colossal-lies-about-bird-bat-mortality-wildlife-biologist/ and by these added considerations: it is a well-known fact that windfarm employees make carcasses disappear. If this weren’t enough, reporting mortality to the authorities is the responsibility of each wind farm operator. Is this a joke? – No, it isn’t, would you believe? Such cynicism, such blatant disregard for ethics, such insults to our intelligence are reminiscent of the much scorned-upon “banana republics” of yesteryear. But since lobbying is a legal activity in America, Europe, Australia, Japan, etc., don’t expect ethics to be upheld there either. As for the media, being “politically correct” means turning a blind eye to any wrong that bears a “green” label, even if it is the yearly death of 123 million birds and bats from 225,000 wind turbines worldwide, to be soon multiplied by 20 (see above), i.e. 2.4 billion deaths a year. B) – Nothing justifies the mass killing of eagles, cranes, storks, and most bird and bat species, by wind turbines and their power lines. The limited success, to date, in stopping other causes of bird and bat mortality does not justify adding another killer! It’s a no-brainer that this is a crooked argument, yet the PC media swallows it whole – hook, line and sinker! C) Two wrongs don’t make a right, they never did. But they deny this, and are trying to force this denial into our brains, by sheer repetition. They are busy brainwashing our children too, in schools! Teachers have become the peddlers of their lethal products. It is quite simply sickening. What happened to our democratic ideals? We are living a scenario written by George Orwell. The accomplices of BIG WIND, in bad faith, deny (by omission or otherwise) that a single drop can spill a full glass, and that measuring the CUMULATIVE EFFECT is essential to the work of conservationists. Third grade students would fail their exams if they denied such universal truths. And I am NOT talking about just a drop: I’m talking about a dripping faucet, I’m talking about 2.4 billion deaths a year (as per above). I am talking about massive extinctions. Here are the principal deniers (by omission or otherwise): Greenpeace, WWF, FoE, RSPB, Audubon Society, Sierra Club, Birds Australia, NABU, LPO, NRDC, Peregrine Fund, CIPAMEX, Birdlife International. Shame on them! They bear the full responsibility of the extinctions to come in which wind turbines (and their power lines) will have contributed. This is why I call them stooges, or gnomes. They don’t deserve respect, and they won’t get mine. I invite everyone to call them “green gnomes” from hereon in, or “gneems” by contraction.